The South Korean government has ordered the daughter of Choi Soon-sil, the woman at the center of a massive presidential scandal, to turn in her passport in a bid to pressure her to return home and face an investigation, diplomatic sources said Tuesday. 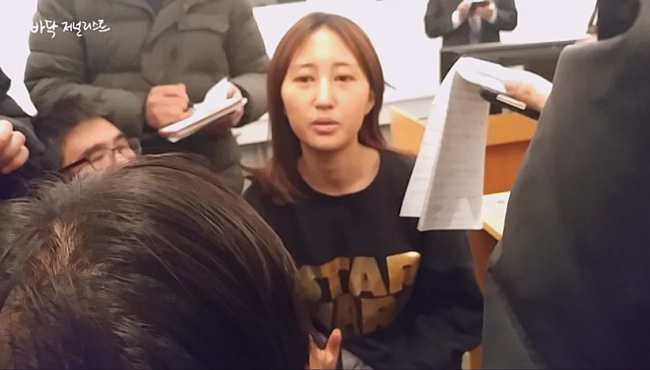 Chung Yoo-ra was arrested in the northern Danish city of Aalborg on Sunday on charges of illegal stay. She is suspected of receiving favors from a Seoul-based college in the admissions process and on tests by taking advantage of her mother's ties to the president. According to the sources, South Korea's ambassador and envoy in Denmark met the 21-year-old, who is currently in the custody of local police, and delivered the order personally to turn in her passport. Under a relevant law, her passport will be nullified within a week. The sources said that the criminal extradition process is underway to bring back Chung to Korea, adding that the government plans to seek cooperation from the Danish authorities as soon as it receives an extradition request from the justice ministry. Confirming the delivery of the order to Chung, the ministry said that it is ready to take steps to nullify her passport unless she turns it in by Monday. Special prosecutors looking into the alleged corruption scandal surrounding President Park and her friend Choi had requested that Interpol put Chung on the wanted list after she declined to respond to the investigation team's repeated summons. At the request of prosecutors, the foreign ministry earlier mailed the order to turn in her passport to Chung's home in South Korea but it was not delivered since she had been staying abroad. Chung's mother is suspected of meddling in state affairs and influence peddling. The president is also accused of conspiring with Choi.